Last month, the Austin City Council approved a resolution ending a controversial process to rewrite the city’s land use regulations, a project known as CodeNEXT. This week, Strong Towns is examining issues surrounding land development regulations in Austin and the CodeNEXT process. This is the first installment in the series—read Part 2, Part 3, Part 4, and Part 5 of the series here. Want to keep talking about this? On October 4 and 5, Strong Towns is hosting a Regional Gathering in nearby Plano, Texas. Space is limited, but, as of today, tickets are still available. The last time I was in Austin, I had an opportunity to meet with the mayor, Steve Adler. He was running over an hour late for our meeting and when he finally entered the room, I suspected two things: (1) he didn’t have time for me, and (2) he didn’t have a clue who I was or why he should meet me. It’s possible I was in a bad mood. Because just before I met with the mayor, I’d had a lunch meeting with the project team behind the city’s proposed zoning code overhaul, known as CodeNEXT. I’d had some misgivings; the plan didn’t seem like a good one. But then Adler and I started to talk, and an hour later, my misgivings were gone. The mayor could not have been more knowledgeable, more engaging, more informed on what was happening in his city, or more invested in what a code rewrite needed to accomplish. And more to the point, we got along great; we even exchanged phone numbers. I was convinced that, if anyone could pull this off, it was this guy. Today I’m going to explain why Austin’s land use regulations are broken. Later this week, we will go into detail about what CodeNEXT was trying to do to address these problems, and why that was going to fail, even had it been adopted. Finally, we’re going to outline a Strong Towns approach and give the city of Austin, and communities experiencing similar pressures, a different path to follow. Modern zoning of the type found in Austin does two things extremely well. First, it facilitates the efficient and predictable development of undeveloped land. Second, it prevents developed land from changing once it has been fully developed. These two objectives worked in harmony in the decades after World War II, when Austin was expanding its boundaries through annexation. Developers could acquire land and profitably work through the regulatory process, delivering needed residential and commercial properties to the market. Those who acquired the homes and commercial buildings valued the “protection” from change zoning provided to their neighborhoods. Widespread prosperity ensued, at least when oil prices were high. Anyone who has been here with us at Strong Towns knows how this story evolves. The land use pattern that American cities adopted after World War II—something we call the Suburban Experiment—creates growth rapidly, providing lots of immediate cash benefits for cities. As part of the development process, cities take on long-term obligations when they agree to maintain, in perpetuity, all the roads, sidewalks, pipes, pumps, drainageways, etc… When the cash the city receives is measured against the cost of those promises, it doesn’t add up. Over the long term, rapid horizontal expansion is a financial loser. This is especially true when zoning codes put neighborhoods under glass, not allowing them to change or adapt to new realities once they are developed. Historically, cities were built incrementally, with every neighborhood continually subject to iterative change. This is how traditional cities dealt with decline; by allowing neighborhoods to renew themselves. When we build neighborhoods all at once, then put them under glass and not allow any change, they don’t hold up well. When every house on a block is built all at once to a finished state, a couple decades later they will all experience stress at the same time. Everyone’s roof will fail at the same time. Everyone’s siding will need to be replaced at the same time. All their appliances will break around the same time. The way neighborhoods, historically, have dealt with this stress is through incremental development. For example, a property owner might remodel and turn their house into a duplex, living in half and renting out the other, using the rental income to finance the upgrade. 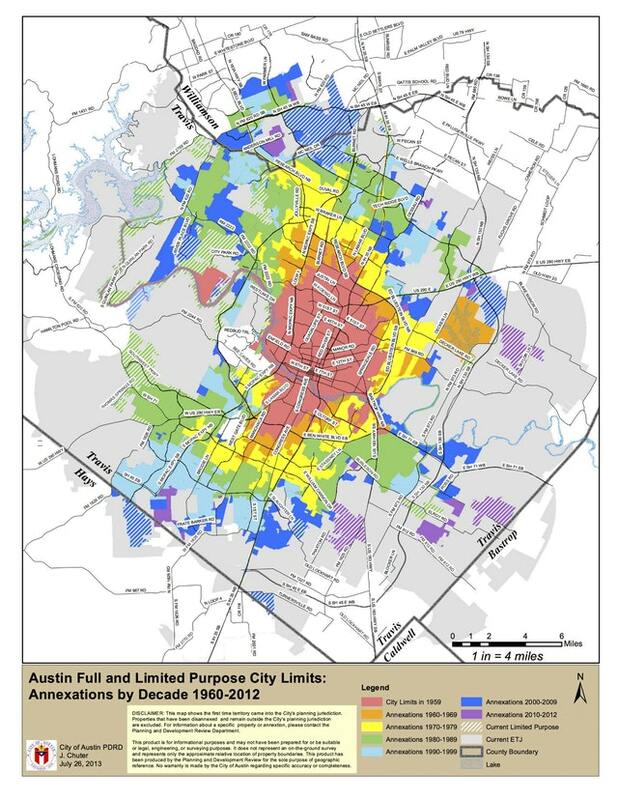 That wasn’t allowed by Austin land use regulations, and still isn’t in most of Austin’s neighborhoods. Thus, neighborhoods sink or swim depending on their ability to retain wealthy people in their ranks. In Austin, many sank. Yet Austin and the surrounding region continued to grow, at breathtaking rates in some decades. All this growth was welcome because it helped with the current budget, while the promised maintenance and repair bill was decades away. But besides a backlog of infrastructure maintenance, another structural problem was starting to creep up on Austin: stifling traffic congestion. Even though it should be obvious to anyone who has taken rudimentary geometry, traffic engineers and land planners struggle to adequately explain congestion. There are two physical mechanisms creating it (there are many other financial, social, and psychological reasons). The first mechanism is the area served. Outward expansion doesn’t grow the city linearly; it does so exponentially. The area of a circle is pi times the radius squared. The further you run a roadway out from the center to serve commuters, the exponentially more area that roadway is collecting from. Collecting creates the second mechanism. In coordination with zoning codes and in service of similar goals, North American traffic engineers have imposed a hierarchical road network onto their cities. Small local streets empty into collector streets. Collectors empty into arterials. Arterials empty into major arterials. Thus, all traffic is collected and, at the same time each day, funneled into the same place. We call this congestion. When you grow the area served while simultaneously collecting everyone to a single choke point, you shouldn’t be surprised when your road network ceases to work. All of a sudden, those (relatively) affordable homes out on the edge can’t be priced only in dollars; they must also be priced in time. And just as those unfunded infrastructure promises made decades ago are piling up, Austin finds itself forced to undertake some massive road expansion projects, just to pretend to do something about congestion. And the growth still continues. The city tried to patch their way through this mess without addressing the Faustian bargain they’d taken on. By allowing new development on undeveloped land while preventing existing neighborhoods from changing—say, building that hypothetical duplex we mentioned a few paragraphs ago—they’d all but guaranteed that they wouldn’t be able to afford their basic infrastructure costs, without really helping reduce congestion at all. They did expand the MetroRail in an attempt to get some people out of their cars, though it’s one of the most pathetic commuter rail systems in the country. Advocates of the system argue that the tremendous growth in ridership since the expansion is a sign of success, but when you start with 800 riders per day, the rate of growth doesn’t matter much. Compared to the scale of the problem Austin faces, MetroRail is an expensive distraction, at best. Another patch has been the city’s embrace of tower building on select sites. Much like MetroRail, luxury condos feel like progress. More housing units are being added, in large and highly-visible blocks, which theoretically is addressing affordability issues. As proponents of this strategy argue, without the supply of housing provided in the luxury condos, housing prices would be even higher. It’s simple economics. This ignores some of the obvious market effects of the tower development strategy. When a multi-million-dollar luxury tower is on the menu, who is going to sell their redevelopment site at mere triplex prices? Land goes way up in price and the marketplace in these areas becomes binary: tower or waiting for a tower (also known as stagnation or, if you prefer, speculation). If you want to understand this further, I’ve written about it extensively. A happy side effect of overwhelming traffic congestion, endless greenfield development, and tower economics is ultra-inflated land prices. Happy, that is, for the cabal of current property owners and city officials. While they may outwardly lament Austin’s affordability crisis, it is in none of their interests to experience a real decline in property values, especially if that decline brought property values down to levels affordable to the typical Austin resident. That would be an economic disaster. What Austin’s current land development code has created is a toxic soup of perverse incentives. The city needs new development to cash flow current expenditures, but new development is only making the city more insolvent in the long run. The city needs elevated property values for the tax base it provides, yet Austin’s affordability crisis has devastating impacts on families and businesses. Neighborhoods oppose change. Congestion is choking the city. Luxury condos aren’t making things better, even if the optics weren’t messed up. Later this week, we’ll look at how CodeNEXT tried to resolve this standoff, and why it failed. Then, we’ll outline a Strong Towns approach, which we hope can serve asa a framework for replacing Austin’s failed land development code with something that will put it on a path to becoming a Strong Town. A recent D Magazine story nailed the problem with Dallas’s development pattern: the city has way more infrastructure than it can afford to maintain. But its solution—assessing local taxes differently—didn’t go far enough.